As is the case every year, this coming November 25th marks the outset of the 16 Days of Activism against Gender-Based Violence Campaign, which will go on until December 10th. On November 29th, the International Day of Women Human Rights Defenders will be observed in this framework. This year, we of IM-Defensoras in consensus with our five national groupings, under the slogan “Women human rights defenders take care of ourselves; we build collective power; we demand protection”, have decided to orient this year’s Campaign towards lending visibility to the situation of risk and aggression experienced by women defenders, using advanced material taken from our Mesoamerican Registry of Attacks against Women Defenders during the 2012-2016 period. We will also remind governments of their obligations regarding our protection and insist on compliance with our demands. And we will foster the increasingly evident and desperate need to adopt Holistic Feminist Protection strategies that offer an optimal response in keeping with the context and specific characteristics of our struggles and movements. To this end, we have designed a campaign image and a series of virtual and printed materials aimed at making an impact in the multiplicity of spheres in which we develop our work. These include communities, movements and on-the-ground organizations where women defenders carry out our daily work, as well as regional and international organizations and agencies, news media, and the general públic. 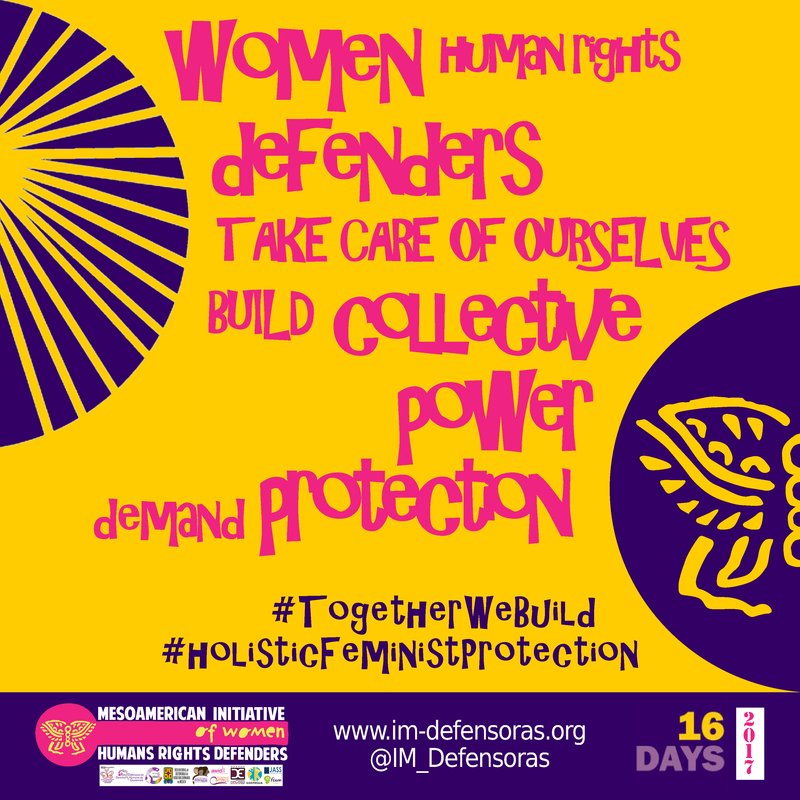 We will disseminate our first set of materials in our social networks, newsletters and web page with hashtags such as #ProtectionNow #WHRDNeverAlone #TogetherWeBuild y #HolisticFeministProtection. The second set, including stickers and posters, will be distributed in our different national groupings in El Salvador, Guatemala, Honduras, Mexico and Nicaragua. The campaign will be officially presented at the Fourteenth Feminist Meeting in Latin America and the Caribbean (EFLAC), and its high point will be on November 29th at an event whose time and place is yet to be announced. In addition to celebrating the life and struggle of women human rights defenders in our region and making our position públic in the corrent context, we will hold the world premier of two vídeos produced by IM-Defensoras; one of these is focused on our work in social networks and the other on women defenders of land and territory. On November 29, a monographic space dedicated to Mesoamerican women human rights defenders is also planned for the Píkara Lab, a project of Píkara Magazine that has the support of the Calala Women’s Fund and in which the IM-Defensoras and the different articulations contribute with different articles and materials. 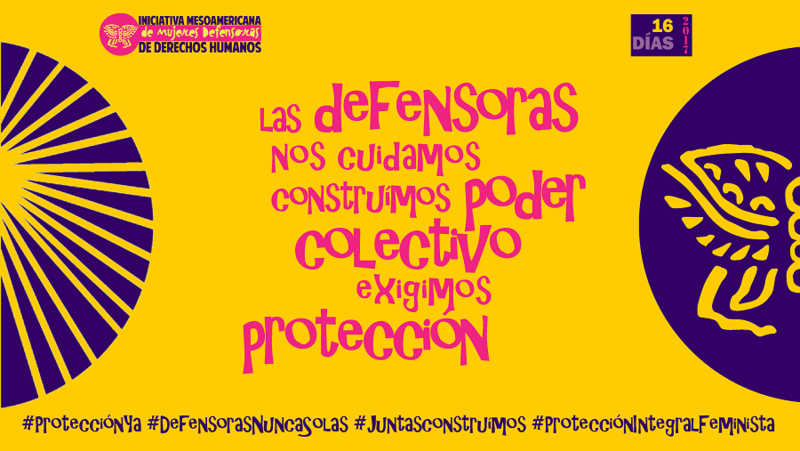 We invite you to get to know and follow the development of our campaign in our social networks and web pages (http://im-defensoras.org/) and to contribute to the protection of Mesoamerican women defenders by sharing and distributing our materials.